The First Baptist Church of Marion was constituted on July 21, 1862, by a Presbytery under the leadership of the Rev. R.H. Moody and the Rev. J.A. Stradley. Records indicate that the original membership consisted of 11 members; 5 men and 6 women. Articles of Faith and Covenant were adopted. Rev. J.A. Stradley conducted a service on August 16, 1862 and September 21, 1862. At its second meeting, the church decided to join the Green River Baptist Association. Rev. C.B. Justice began his pastorate of the infant church in August, 1863. He held the first service at the residence of Isaac. Reel, and then began holding services in the Duncan School House, a log building located in what is now East Marion. At this time the name of the church was changed from “Marion Baptist Church” to “Mt. Carmel Baptist Church.” Services continued to be conducted at irregular intervals during 1863 and 1864. In June, 1865, Rev. John F. Pendergrass was elected pastor of the church where he served as pastor until July, 1878. In July, 1872, the church acquired a building site in Marion for the purpose of erecting a church building. At this time, the name of the church was changed back to its original name, “Marion Baptist Church.” A site was secured on North Main Street in Marion where the Educational Building is now located. A small wooden structure was started; but due to the difficulty in raising funds, the construction progress of the building was slow. No service could be held in the new church house until September, 1878. 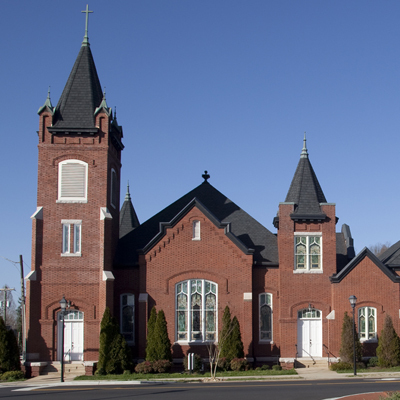 The first service was held in the new building on September 21, 1878. By 1880, the church had a total membership of 73. For the thirty year period following 1878, the following ministers served the church as pastor: Rev. Squire Trivett, Rev. J.B. Richardson, Rev. C.B. Justice, Dr. M.M. Landrum, Rev. B.K. Mason, Rev. R.L. Patton, Rev. S.C. Cashwell, and Rev. W.B. Morton. For the period since 1908, the following ministers have served as pastor: Rev. Edward Long, Rev. W.H. Moore, Rev. G.A. Martin, Dr. J.T. Bowden, Rev. P.D. Mangum, Dr. B.F. Bray, Rev. M.O. Owens, Jr., Dr. Thomas Eugene West, Rev. Joseph P. DuBose, Jr., Dr. J. Dewey Hobbs, Jr., Dr. Robert R. Davis, and Dr. M. Scott Hagaman. William M. Blanton, father of J. D. Blanton, was Senior Deacon and served as Deacon and taught the Men’s Bible Class for 35 years. B.B. Price served as Treasurer from 1880 until his death, June 14, 1918. He served as a Deacon Chairman, Sunday School Superintendent, and as a Baptist denomination leader in Marion and McDowell County for more than 40 years. In 1972, W. R. Chambers, was named Deacon-For-Life, the first deacon ever so named in the church. He served the church continuously as a deacon from February 4, 1920 until September 30, 1946. The Woman’s Missionary Society of the church was organized in 1889 during the first year of the pastorate of Dr. M.M. Landrum with Mrs. J.L. Morgan as President. She also founded the WMS of the Blue Ridge Baptist Association and was President for many year. To accommodate the growth of the church, new facilities were added and existing structures were updated. A new Pastorium was built on nearby Madison Street in 1947. An Education Building directly adjoining the Sanctuary was constructed in 1949. The interior of the sanctuary was dramatically renovated and reconfigured in 1952, producing the distinct walnut woodwork and divided chancel. Then, in 1959, the congregation purchased the adjacent property and buildings owned by The First Methodist Church. The former Methodist Sanctuary burned in 1975, while the Education Building (now referred to as the Children’s Building) became vital space for Christian education, childcare and fellowship. The total membership of First Baptist Church by 1960 had reached 992. Since the 1960s First Baptist Church of Marion has continued and enhanced the hallmarks of church life: meaningful worship, excellent church music, quality Christian education, stable leadership, and also a progressive viewpoint rarely seen by Baptists in the South. In 1964, Dr. J. Dewey Hobbs was called as pastor and served the church for the next 20 years. Also, in 1964, Rev. R. Willis Abernethy was called to serve as Minister of Music. He held that position for 27 years. During the 1960s, a 35-rank Moller organ was installed and hand bells were purchased. Graded voice and hand bell choirs became cherished aspects of weekly worship. Large cantatas and musicals were regularly presented, especially at Christmas and during the summer months. Youth Choir Tours occurred to destinations in the United States and abroad. Locally, First Baptist Church saw opportunities to spread the Gospel in Marion and McDowell County. In 1966, a daycare was established, the First Baptist Children’s Center, to serve all the children of the community, white and black. This was the first state licensed daycare in McDowell County. In the late 1960’s, North Marion Chapel was established through the efforts of M. D. “Mason” Ledbetter and other church leaders. This mission of First Baptist was constituted as Grandview Baptist Church in 1968. Also, Sunday morning campground ministries began at Bear Den on the Blue Ridge Parkway and Benfield’s Landing on Lake James. J.B. “Red” Walker, Bill Ledbetter, and Robert Rowe supplied much of the passion and leadership behind these important tourism ministries that continue today. After several summers as a youth ministry intern, David B. Smith was ordained to the Gospel Ministry by First Baptist Church on September 26, 1971. For years, women had provided vital leadership in First Baptist Church. But never had a woman been elected Deacon. In 1977, that changed when Mrs. Jean Abernethy was elected and ordained to the Diaconate. Since that time, many women have served First Baptist Church as Deacons, expressing the congregation’s belief that God calls men and women to all levels of leadership in Christ’s church. In 1984, Dr. Robert R. Davis was called as pastor. He too was long tenured, serving the church for 17 years. Under Dr. Davis’ leadership, the characteristic passion for missions, music, and worship continued. At the same time, a deeper sense of conscience and servanthood grew within the fellowship. Committee structures were developed and expanded, providing greater opportunity for shared-leadership. Local ministry needs were recognized and pursued. First Baptist Church was instrumental in the birth of Habitat for Humanity and Hospice in McDowell County. Also, the needs of the world beyond Marion were addressed as church members literally traveled to the ends of the earth to serve God and humanity. In June, 1992, Joanne Johnston was commissioned and sent to China as a summer missionary. Also, in 1992, a mission team was sent to South Florida to assist the victims of Hurricane Andrew. Then, in 1993, another mission team travelled to Providence, Rhode Island to work with Habitat for Humanity. Rev. Terry D. Childers was called as Minister of Music and Education in 1993. His titled was later updated to be Associate Pastor for Music and Administration. Rev. Childers’ leadership continued the tradition of excellent church music and well-planned worship. He also helped establish an ongoing Senior Adult Ministry called “Saints Alive.” As in past years, Youth Choir Tours shared the Gospel through song and service in many locations, including Chicago, New York City, San Antonio, Texas, and Boston, Massachusetts. Rev. Childers helped develop one of the church’s important ongoing local mission efforts. In 1997, Operation Inasmuch began as an annual one-day blitz of local missions work. The, in 2014, after 21 years of service, Rev. Childers retired. After many years of successful summer youth workers, the congregation had a dream to expand the ministry to youth and children. Consequently, Donna S. Shook was called as Minister of Youth and Children in 1994. The following year, Rev. Shook was ordained to the Gospel Ministry by First Baptist Church, which again demonstrated the congregation’s conviction that God can and does call women to serve the church, including as ordained ministers. Later with the title of Associate Pastor for Youth and Family, Rev. Shook would serve First Baptist for 14 years, developing comprehensive youth and children’s ministries. Sunday evening “Koinonia” became a weekly opportunity for teenagers to grow in Christ and in relationship to one another. Along with many annual camps, retreats, and fellowships, Youth Mission Trips were taken to Nikiski, Alaska and, in the aftermath of Hurricane Katrina, to Pearlington, Mississippi. Women in church leadership roles and issues around biblical interpretation became particularly divisive in the late 20th Century in the Southern Baptist Convention. A Fundamentalist perspective became dominant in the leadership and policies of the SBC, which tested the collective conscience of First Baptist Church of Marion. In 1994, the congregation elected to send their budgeted missions dollars exclusively to the Cooperative Baptist Fellowship rather than the Southern Baptist Convention. Then, in June 2002, First Baptist Church held a vote to sever ties with the SBC. After months of congregational discussion, education and prayer, the standing vote showed overwhelming support and no opposition. Dr. M. Scott Hagaman was called as pastor in 2003, bringing with him a missional perspective and an appreciation for the church’s longstanding traditions in music and worship. As old denominational relationships changed, new ones formed for First Baptist Church of Marion. The Cooperative Baptist Fellowship both state and global became the congregation’s primary partners for global missions and ministry. Also, hands-on mission work locally and in faraway places became a passion for the congregation. In 2005, a mission team of 11 traveled to Belize to conduct medical clinics and construction work. Later that year, the church voted to partner with the Baptist Association of Belize, producing a many mission teams that have ministered in the Central American country. In 2005, a sister church relationship was begun with Dalbeattie Baptist Church in Scotland, United Kingdom. A mission team was sent in 2006; then, the following summer, Krista Pool, was commissioned and sent as a Summer Children’s Ministry Worker. In 2007, a partnership with Asheville pastoral counselors located a Marion satellite office within the church facilities. A partnership was initiated with Primera Iglesia Bautista Ebenezer and their pastor Rev. Armando Juarez in 2010. For a five year period, all church facilities were shared with the young, Spanish-speaking congregation, until they moved to their own facility. In 2010, First Baptist Church helped start the Good Samaritan Clinic of McDowell; and then in 2016, the congregation helped birth CareNet Counseling of Marion. Church member and deacon chairman Stephen R. Little was elected in March 2010 as Moderator of the Cooperative Baptist Fellowship of North Carolina, the top elected position for the state organization. Rev. Lisa A. Williams was called as Associate Pastor for Faith Development in 2008 and served until 2010. On August 31, 2011, Matthew D. Roberts began his service to the church as Associate Pastor for Youth and Children. He was ordained to the Gospel ministry by First Baptist Church on April 1, 2012. His job title and duties later grew, becoming Associate Pastor for Faith Formation, serving youth, adult education, and senior adults. After serving as Interim Director of Music Ministry, Mrs. Ruth T. Wakefield became permeant in that position in 2015. Rev. Christi S. Hollifield became the Minister with Children in 2016. She was ordained to the Gospel Ministry by First Baptist Church on October 8, 2017. Facility needs became ever apparent during the first decade of the 21st century. The buildings of First Baptist Church were aging and outdated. Therefore, in March, 2006, a Long Range Vision and Planning Committee Report was approved and a Building Exploratory Task Force formed to develop comprehensive facility improvement plans for the church. Extensive exterior restorations of the Sanctuary and Education Buildings were undertaken in 2010. Then, in 2011, the Renew to Serve Stewardship Campaign was conducted with plans to renovate the 1949 Education Building as well as the basement level of the 1912 Sanctuary Building, and to construct a new Fellowship Hall named in memory of the Blanton Family. The Renew to Serve Building Task Force was elected in 2012 and construction was completed in May 2015. Upon opening the newly renovated and expanding facilities, the 2.2-million-dollar project was paid in full. In 2016, at a cost of approximately $110,000, the old fellowship was dramatically renovated, creating a state-of-the art Youth Ministry Center.